Costs – Are you looking to have your trees pruned or removed? Find out what professionals in the Myrtle Beach area charge for these services. FAQs – Myrtle Beach is home to many trees of the fruit and flora variety, but maintaining them takes knowing the climate and the current pest and diseases. Learn more. Services – Find professionals near your home who can help keep your trees in top condition. How Much Do Tree Services Cost in Myrtle Beach? Trees are not just pleasing to the eye, they also add priceless value to a home by providing shade from the sun; a place for birds and animals to live; and fresh fruit, nuts and berries that grow on many types of trees in the Myrtle Beach area. While trees are essential to the health of the environment, they do require regular care in order to thrive. Before arranging for tree care or planting new trees, there are some things that Myrtle Beach homeowners should know. The average cost to remove a tree in Myrtle Beach is $664. The exact cost that a homeowner pays will depend on factors such as the tree’s diameter and height; whether the tree includes any hazards such as proximity to power lines or the presence of a bee’s nest; and whether special equipment like a bucket truck is needed to remove the tree. The typical cost of removing a tree stump is $2.50 per inch diameter of the tree trunk. Some tree removal specialists will include stump removal in their tree removal quotes while others charge separately for the service. Pruning and trimming trees may be necessary to protect structures near the tree, to guard against problems with nearby power lines or to maintain the tree’s appearance. Homeowners in Myrtle Beach can expect to pay an average of $300 per tree for trimming and pruning services. Myrtle Beach received its name from the sweet myrtle tree, which is commonly referred to as the crape myrtle and is native to the area. It can grow up to 90 feet tall but usually reaches a height of 40 to 50 feet. The cabbage palmetto can withstand hurricane force winds, even when neighboring oaks and pines are downed by the fierce storms. The tree is creating a hazard. A certified arborist has declared the tree diseased or infectious. The tree or its root system is causing damage to a structure or a public path like a sidewalk or street. The tree is causing damage to underground power lines. If a tree is causing an immediate hazard, the best time to remove it is as soon as an arborist can take it down. For deciduous trees, it may be easier to remove it in late fall or during the winter once its leaves have fallen. For evergreens, tree removal may be easiest in December through February while the tree is dormant. Trees are responsible for up to 30 percent of power outages. Within 30 feet of overhead power lines, trees should be less than 20 feet tall. No trees should be planted within 6 feet of overhead power lines. Between 31 and 60 feet of overhead power lines, trees should be less than 40 feet tall. Taller tress can be situated at least 60 feet away from overhead power lines. Trees such as silver maple, Norway maple, oak, Colorado blue spruce, white spruce and most pines should not be planted near overhead power lines due to their propensity to quickly reach an extensive height. The South Carolina state tree is the sabal palmetto, also referred to as the cabbage palmetto. It’s featured on the South Carolina state flag, seal and the quarter. The tallest trees in Myrtle Beach include species of oaks, tulip poplars, loblolly pine, and white and green ash trees. The shortest trees that grow in Myrtle Beach include the Japanese maple and the Kwanzan cherry tree. Native trees such as the southern magnolia and the cabbage palmetto thrive in the warm and humid environment of Myrtle Beach. Crab apple trees, oaks that are allowed plenty of growth space, and maples will also do well in this moderate environment. 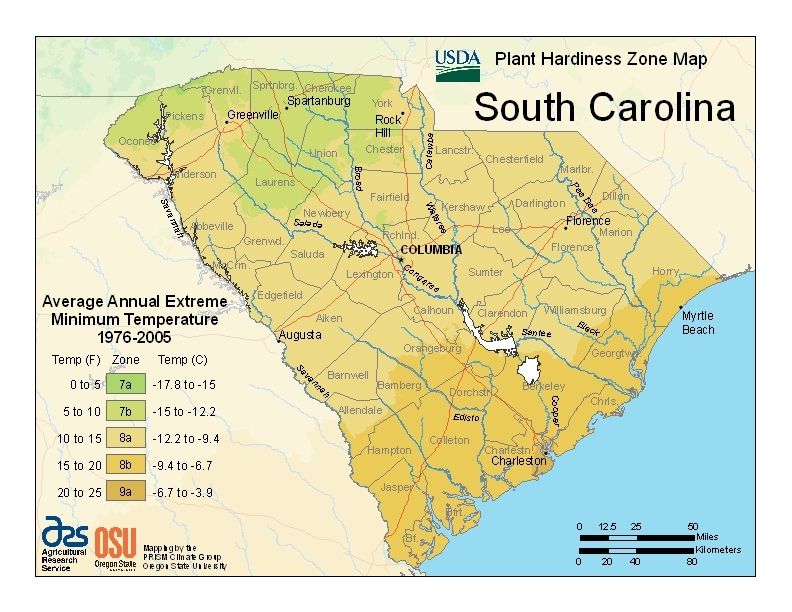 The coastal areas of South Carolina are not as well-suited to fruit trees as other areas of the state. Some growers find success with apple, cherry, peach and pecan trees. For the best results in growing fruit trees, the trees may need to be sprayed to prevent disease and insect infestation. Sweetgum trees produce nuisance seed balls and are easily damaged or destroyed by piling mulch near the tree’s roots. Crab apple trees are messy and may attract unwanted vermin and insects that feast on the fallen fruits. The oak trees in Myrtle Beach are prone to diseases including leaf spots, bacterial leaf scorch, chlorosis and oak wilt. Apple and crab apple trees are prone to apple scab, cedar-apple rust, powdery mildew and fire blight. 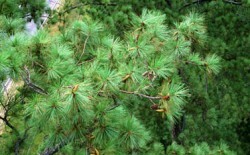 The loblolly and other pines are prone to diseases that include fusiform rust, eastern gall rust, pine needle rust, white pine blister rust, pitch canker and tip blight.